This site was really in need of some Tender Loving Care. To try to rectify that I have given it a nice new theme. I will also attempt to add a bit more content. I am sure I have lots that would be of benefit to others. Posted in Blog on September 1, 2014 by Chris Woollard. Thanks to Alan Bell for organising a wonderful Christmas dinner at Dans Le Noir last night. It was a wonderful venue and the food was amazing. I never realised how dark, dark could really be. I would recommend this restaurant to anybody. Also remember, this is the only restaurant where you can get away with eating with your fingers and licking your plate when you are finished. As it is so dark, who would ever know. In summary buy this book if you want to learn Perl. Simply put, this is the best book I have ever found to teach you Perl. I first read a version of this book in 1999. It was a good book then, that has matured and gotten even better over time. This book covers everything that you need to know to get you started with Perl. Perl isn’t the easiest language to learn, but this book explains everything as simply as possible. Even the chapter on regular expressions. This particular edition covers Perl 5.10, which has now been replaced by Perl 5.12 (This book was written 2 years ago). That doesn’t really matter as this won’t impact on you. Perl 5.12 is mostly a bug fix release, which adds few new features. One of Perl’s strengths is CPAN (Perl’s on-line module library). The book does have a chapter dedicated to it, but it only covers a handful of modules. I would have expected the book to cover a few more of the more common ones. This may just be me being a little picky. Please note: I did receive a free copy of this book via the O’Reilly Blogger review programme. 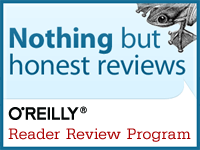 Posted in Books and tagged books, oreilly, Perl on January 5, 2011 by Chris Woollard. It has been a long time coming, but finally this book has been updated. With the 4th edition comes a big change. This edition has been updated to ONLY cover Python 3.x. This is a great book and will make a great addition if you want to learn more about developing applications with Python. You should note however, that this book is not a Python reference guide. It is written primarily as an advanced tutorial that is a follow-up to the Learning Python book. Therefore it does not cover any aspects of core Python. For that you would be better of looking at Learning Python. This book is over 1600 pages long. This makes it particularly heavy. I do not recommend that this book be kept anywhere that it can fall from. It will hurt if you happen to get in its way. There are a couple of omissions that surprised me. In the chapter on GUI programming. I expected there would be more on using either PyGTK or PyQt. They are mentioned, but that is it. tkInter is covered instead. Personally I have not seen TK used for quite some time. Most of the applications that I have seen use PyGTK (mostly because I use Ubuntu). Another omission is that there is no mention of Quickly. Which is a framework that allows you to develop applications quickly. Posted in Books on December 27, 2010 by Chris Woollard.